Canvas carrying case with velcro closure and wristlet. The perfect accessory for the Tip Pee Toe™ portable, toddler step stool. Carrying case keeps your folded, child step stool covered when transporting it in your purse or diaper bag. The case is designed to hold one folded, toddler step stool. It has a velcro closure which keeps the folding step stool secure inside. The black wristlet allows you to carry your kids step stool on your wrist and leaves your hands free while you are assist your child while on the portable step stool. 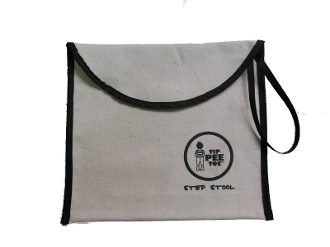 Material: Canvas with nylon wristlet and trim. Color: Natural w/black trim and wristlet.